Thomas Burrows does not have any MLB stats for the season. Draft: 2016, Seattle Mariners, 4th rd. Split the season between Rome (A), Florida (A+) and Mississippi (AA) and combined to go 6-2 with a 2.66 ERA (20 ER/67.2 IP), 11 saves and 86 strikeouts across 45 games...Ranked in the Top 10 among Atlanta's relief prospects (min. 30 IP) in saves (T3rd, 11), hits per 9.0 innings (5th, 6.4) and ERA (8th, 2.66)... Allowed opponents to hit just .199 (48-for-241). April 2, 2019 LHP Thomas Burrows assigned to Gwinnett Stripers from Mississippi Braves. 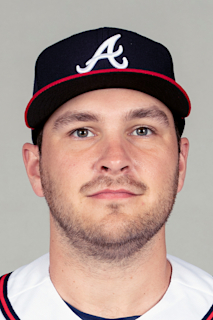 January 28, 2019 Atlanta Braves invited non-roster LHP Thomas Burrows to spring training. September 12, 2018 LHP Thomas Burrows assigned to Peoria Javelinas. July 20, 2018 LHP Thomas Burrows assigned to Mississippi Braves from Florida Fire Frogs. April 8, 2018 LHP Thomas Burrows assigned to Florida Fire Frogs from Rome Braves. March 16, 2018 LHP Thomas Burrows assigned to Atlanta Braves. May 16, 2017 LHP Thomas Burrows assigned to Rome Braves from Danville Braves. May 15, 2017 LHP Thomas Burrows assigned to Danville Braves from Rome Braves. January 11, 2017 LHP Thomas Burrows assigned to Rome Braves. June 23, 2016 LHP Thomas Burrows assigned to Everett AquaSox from AZL Mariners. June 20, 2016 LHP Thomas Burrows assigned to AZL Mariners from Everett AquaSox. June 17, 2016 Seattle Mariners signed LHP Thomas Burrows. June 17, 2016 LHP Thomas Burrows assigned to Everett AquaSox.